Just finished watching Cameraman: The Life and Work of Jack Cardiff (on TCM Classics). 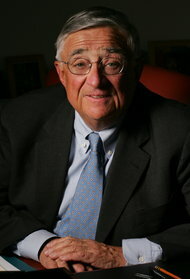 It is a 2010 documentary film that explores the work of deceased cinematographer Jack Cardiff. It reviews his work and, with the input of many of his contemporaries, examines his legacy as one the most influential film makers of his generation and details how he became master of the Technicolor process. DO CHECK THE NEXT POST for more on his work on 'Black Narcissus'. 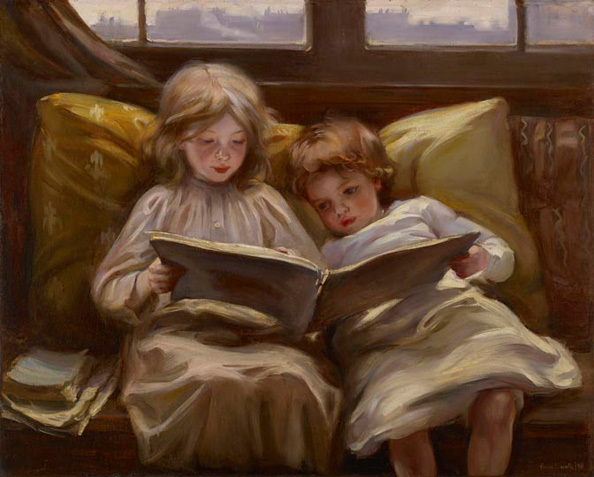 Laura Muntz Lyall. 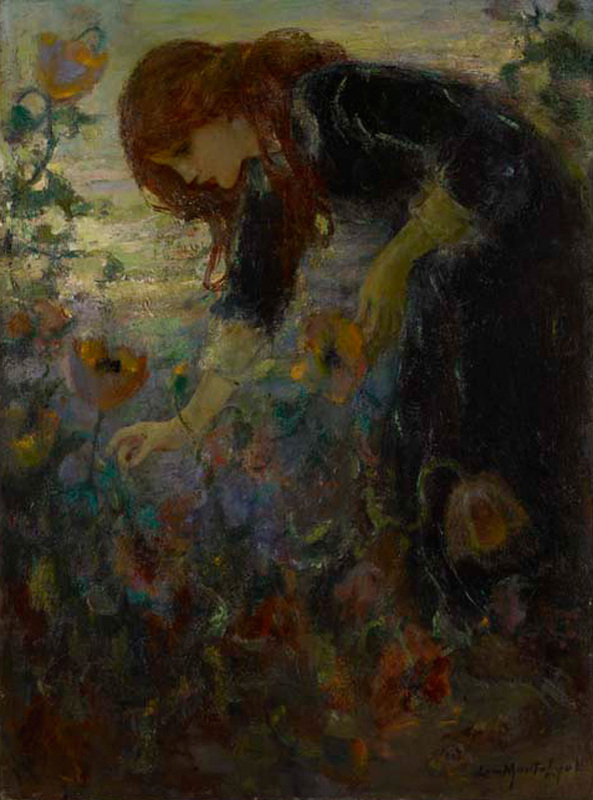 Oriental Poppies. Was at the Art Gallery of Ontario on Thursday and this one was one of my favourite! Olympia & York (also spelled as Olympia and York, abbreviated as O&Y) was once a major international property development firm based in Canada. The firm built major financial office complexes like Canary Wharf in London, the World Financial Center in New York City and First Canadian Place in Toronto. 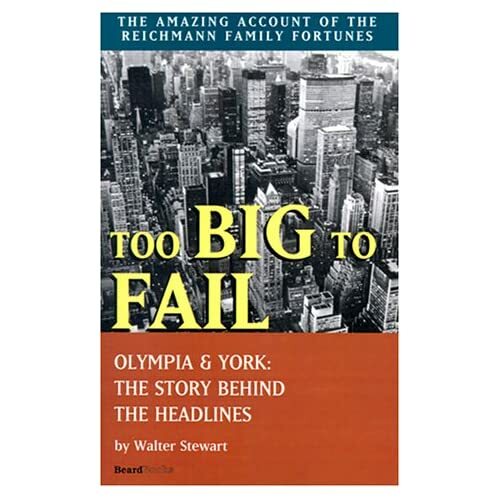 It went bankrupt in the early 1990s and was recreated to eventually become Olympia & York Properties. First Canadian Place, Toronto - including Exchange Tower, First Bank Tower. Olympia & York Properties Corporation owns 18 properties in 6 Canadian cities. 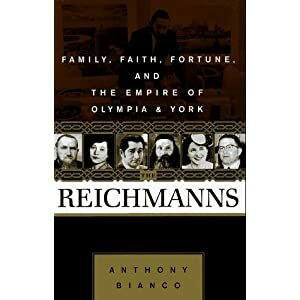 "What was most striking about the Reichmanns' dealings in Olympia & York's embryonic stage was not that they invariably lived up to their end of a bargain but that they did not always hold their clients to the same standard. Often, *their word was not only their bond but an all-purpose warranty. Once Sirlin (Morley Sirlin - O&Y's early architect) was reviewing a plan for Delta Electronics, a local retail chain, with its president who insisted that he had been quoted a price that included a fieldstone lobby. Sirlinm who had designed a conventional lobby, telephoned Paul Reichmann. "I don't remmeber it that way," Reichmann replied, "but if he says I said he could have stone, then give him stone." Similarly, Wos (Frank Wos- O&Y's first construction supervisor) once was dispatched to make repairs to a long-completed building that had been flooded through no fault of Olympia & York's. "I didn't like it because I knew it was caused by the tenant's bad maintenance," Wos recalled. "I told Albert it was not our responsibility. He said, 'No, it's not, but it is my money. So go back and fix it.'" *"Their edge was their integrity," he said. "They put themselves on the line and they lived on the line." 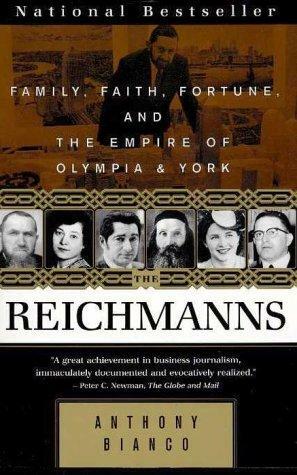 "The Reichmanns very early on developed a lot of business just on that basis. If they shook on a deal, that was it. Their word was their bond." One of the best exhibits! Was here today! Starting October 13, visitors to Toronto’s Gardiner Museum will be transported to another time and place through the evocative exhibition, The Tsars’ Cabinet. The Tsars’ Cabinet presents more than 200 examples of decorative arts, including objects with Fabergé mounts, gilded dinner services, imperial porcelain eggs, and historic court photographs that document the extravagance and sumptuousness of life in palaces and yachts during the Romanov era. The exhibition follows the history of the tsars and their family, including Peter the Great, Catherine the Great and Nicholas II, the last Tsar of Russia. The Tsars’ Cabinet also features intimate Romanov family photographs from the Toronto-based Di Rocco Wieler Private Collection and personal artifacts once owned by Grand Duchess Olga, the younger sister of Tsar Nicholas II, who spent her final years living in Toronto. Most of the objects in the exhibition were specifically designed for and used by the tsars and members of the Russian imperial family. The pieces include magnificent examples of works from the Imperial Porcelain Factory, the Imperial Glassworks, and the private firms of Fabergé and Ovichinnikov. Many of the objects are extremely rare and offer one of the best opportunities to see outstanding imperial Russian art outside of Russia. The Tsars’ Cabinet was developed from the exceptional private collection of Kathleen Durdin, and organized by the Muscarelle Museum of Art at the College of William and Mary in Williamsburg, Virginia, in collaboration with International Arts + Artists, Washington D.C. The Gardiner Museum is the first stop of an international tour. Tim Walker was not the first Vogue photographer to gain inspiration from Hans Christian Andersen's fairy tale The Princess and the Pea. In the 1950s, while staying with the Woolworth heiress Barbara Hutton in her Moroccan palace, John Deakin came across a room piled with mattresses, which gave him an idea for a picture. He ran into a lunch party in full swing: 'All those mattresses – the princess and the pea! The princess and the pea!' he exclaimed. 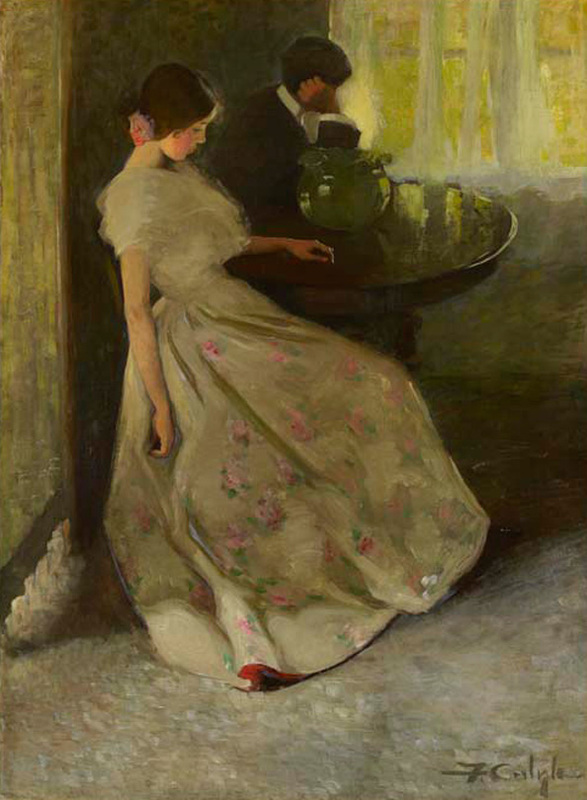 There was a gasp from the hostess, who had loathed Deakin on sight but was too polite to banish him. The guests made their excuses and left. It was explained to Deakin that had not Miss Hutton once been the Princess Mdivani? And that 'pea' to American ears meant something altogether different… Deakin was asked to leave Tangiers. Reading 'The Reichmanns' today piqued my interest in city of Tangier/ Tangiers! About 1/3 of the book is about their life in this city in the 1940s. So interesting. Almost anyone would have hankered to have a personal portrait shot by Cecil Beaton. He made his subjects, many of them distinguished or celebrated to begin with, seem impeccably elegant and disarmingly good-looking, seldom employing any of the irony or social commentary that other photographers often used. 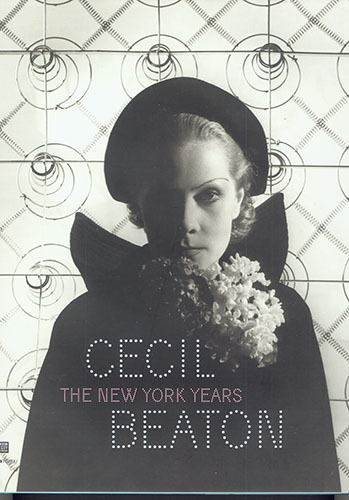 Now comes a coffee-table book, accompanying an exhibition at the Museum of the City of New York, that contains some of the finest photographs Beaton took during his many sojourns in New York, as well as sketches, designs and caricatures that this aesthetically versatile artist drew for the movies, theater, opera and fashion. It is a pleasure to leaf through the thick ­pages of ­CECIL BEATON: The New York Years (­Museum of the City of New York/Skira/­Rizzoli, $65) and see Greta Garbo at her mysterious peak and Marilyn Monroe at her most luscious. Brando, Astaire, Warhol, Capote, Callas, Coco, Liz — people recognizable by a single name — flocked to Beaton or were lobbied by him. “I only photograph those I know and admire,” he said, in an unguarded statement. Ambitious and a canny networker, but possessed of a penetrating eye for stylishness, he impressed tastemakers. His photographs were soon gracing Vogue and Vanity Fair — in time helping to generate the glamour that Depression-era New York needed, just as it needed the lift of a flamboyant Busby Berkeley movie. An anti-Semitic joke that he included in the margins of an illustration a year before World War II lost him the Vogue account, but he regained his stature with a famous photograph of a young girl with a bandaged head clutching a doll and sitting up in a hospital bed in the days of the London blitz. Today it seems highly romanticized, possibly even staged, in the manner of a Norman Rockwell painting, but it landed on the cover of Life and became a powerful symbol of what Britain was enduring. Suit by Digby Morton. Vogue (British Edition), September 1941. This picture pretty much summarizes why I've loved the Second World War fashion. Actually it instantly brought to mind what my mum said when we were watching a documentary of the WWII a long time ago - that women in those days even when there was disaster and rubble all around they still wore their high heels and were always perfectly dressed. I truly admire them. The logo used in promotion of the show. Departures (also promoted as departures.) is an adventure travel television series. An original Canadian production, the show aired on OLN from March 17, 2008 to June 19, 2010. The show is hosted by Scott Wilson and Justin Lukach, produced by Jessie Wallace and Steven N. Bray, and directed/shot by Andre Dupuis. The first two seasons of the show have thirteen episodes each, while the third has sixteen episodes. Lukach has stated that a fourth season will not be made, as Wilson and Dupuis are working on a new show, "Descending", due to air in January 2012. 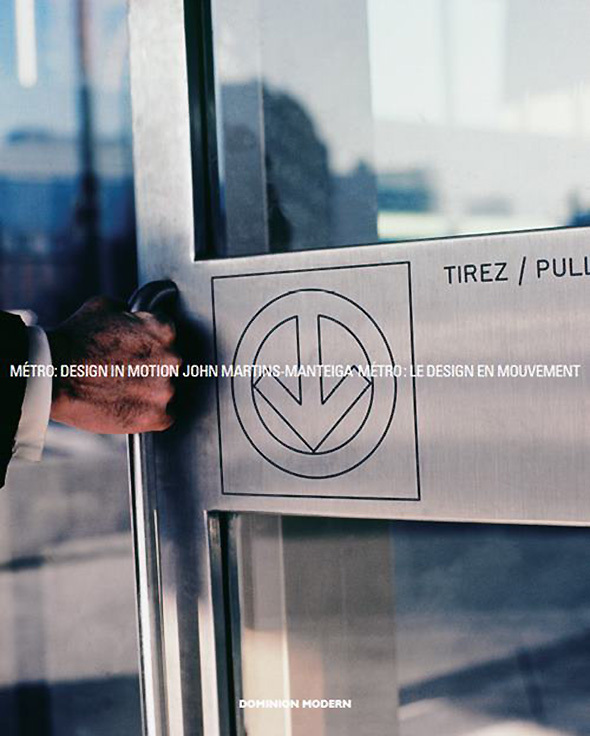 The first thought that came to mind when I arrived at INabstracto for the launch of John Martins-Mantiega's latest book, Métro: Design in Motion, was why hasn't anybody given the TTC such a lovely and thorough treatment? Spread over 450 pages, Mantiega's new book is more that just a love letter to the Montreal subway and the remarkable people who made it possible — it's a tribute to modern design and the pragmatic spaces we often take for granted. I'd love to read — or perhaps even write — something similar about the Toronto subway, even if the story isn't as compelling or Canadian in its design history. Needless to say, this isn't an easy task. It took over three years for Martins-Mantiega to write Metro. Part of this has to do with the amount of research and documentation that went into the book, but it also has to with funding. It's a challenge to publish books of this nature, and the journey wasn't always a smooth one — but here's the book, and it's fantastic. So too are the photographs on display. As much as I enjoy viewing (and posting) archival photographs, there's something about seeing larger versions in person that really get me enthusiastic. 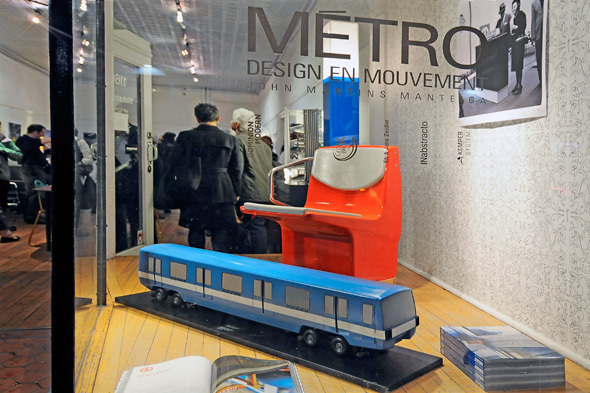 But perhaps even more cool than the photographs is the model subway train and orange seat in the window of INabstraco. Seeing them displayed this way really drives home the degree to which they're design objects, something that's all too easy to forget. "That little train is probably the most important piece of industrial design that Canada ever produced," Martins-Manteiga declared at last night's launch. That might be overstating it, but it was still a remarkable accomplishment, particularly given the timelines the designers had to work with. 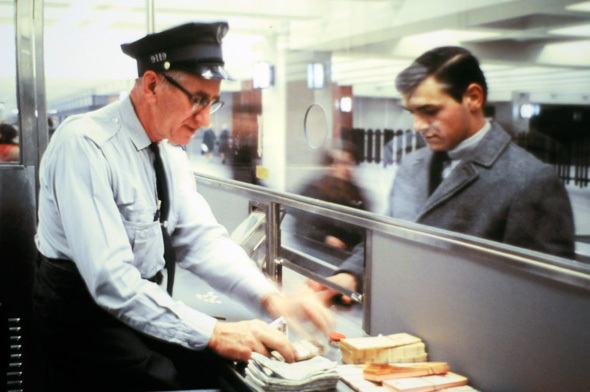 20 of the original stations were completed in just four years to coincide with Expo 67. At the media preview for the new TTC streetcars I attended earlier today, it was revealed that full incorporation of the vehicles isn't expected until 2018. And that's just vehicles — no stations. That gives a bit of perspective into just how quickly the Montreal system came together. It's also interesting to note that Toronto's new streetcars will be built by Bombardier, which blossomed into the large-scale company it is today on account of their construction of Montreal's subway cars. It may not be the Toronto subway book I'm hoping for, but Metro: Design in Motion is well worth the read for design buffs and transit history fans. And even if you don't fall into either of these categories, having a look at the exhibit is still highly recommended. 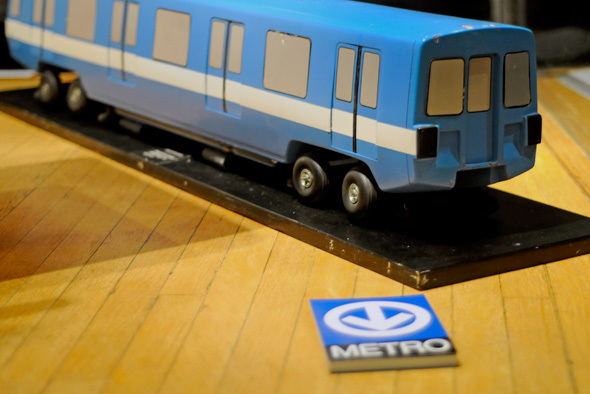 Metro: Design in Motion will be up at INabstracto until November 27th. 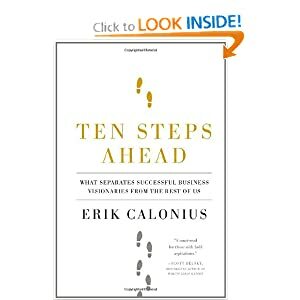 The book can be purchased there or at Swipe Books. Sunnyside Amusement Park was a popular amusement park in Toronto, Ontario, Canada that ran from 1922 to 1955, demolished in 1955 to facilitate the building of the Metro Toronto Gardiner Expressway project. It was located on the Lake Ontario waterfront at the foot of Roncesvalles Avenue, west of downtown Toronto. The name 'Sunnyside' was the name of a local farm owned by John George Howard, which was situated just to the north, on the location of the current St. Joseph's Medical Centre. Sunnyside Avenue runs north-south from that location north to Howard Park Avenue today. John Howard is also famous as the original landowner of the nearby High Park. Prior to the construction of the park, the shoreline was a narrow stretch immediately to the south of the 1850s era rail lines. There was enough area for a restaurant and a small fenced off area was provided for changing into swimwear. To the east, the club-house of the Parkdale Canoe Club jutted out into the lake. A plan was developed in 1913 by the new Toronto Harbour Commission to improve the shore lands from the foot of Bathurst Street to the Humber River. The plan, which included four miles (6 km) of breakwater, infilling of land, and the construction of the Lake Shore Boulevard, cost $13 million, and was paid for by the federal government. A boardwalk along the south side of Lake Shore Boulevard was built, from the Humber River east to Wilson Park Avenue, 24 feet (7.3 m) in width using white pine planks. This corresponded to the length of shoreline that was extended out into the lake. This boardwalk became the site of annual Easter Parades until 1953. It was rebuilt in 1934 as a make-work project and was paved using asphalt in the 1960s. The Amusement Park lands themselves were completely created from sand dredged from the bottom of the bay and top soil from a farm in Pickering, Ontario. The original shoreline was extended into the lake by approximately 100 metres, from the foot of Wilson Park Avenue west to the Humber River, a distance of about 1 kilometre. Only a small length of the original shoreline and beach exists today, located between the Boulevard Club and the Canadian Legion building at the intersection of Dowling Avenue and Lake Shore Boulevard. One of the first new buildings was the Sunnyside Pavilion, a curved structure providing a restaurant with views of the lake. It was located just to the east of Parkside Drive at the shoreline. Following this, the Sunnyside Bathing Pavilion and Dean's Sunnyside Pleasure Boats buildings were constructed. Soon after, concessions were requested and granted to operate amusements on the lands. Sunnyside Amusement Park opened in 1922. At the time, there was an existing amusement park on Toronto Island at Hanlan's Point. It only operated a few more years until 1927 when a baseball stadium at the foot of Bathurst Street was built, replacing the stadium on the Island. Another amusement park, the Scarborough Beach Amusement Park was built in Scarborough, Ontario, to the east of Toronto. Sunnyside Pavilion provided two restaurants and a tea garden facing the lakeshore. It was curved into a crescent with the tea garden positioned within the semicircle. It was designed by the same architects and was in the same style as the Bathing Pavilion, immediately to the west. It was built in 1917 on the south side of Lakeshore Road. When built, its south side was on the lakeshore. As infill proceeded it ended up about 50 metres from shore, on the north side of the new Lake Shore Boulevard. In 1920, the building was enlarged and a new south entrance was built facing the lake. The restaurant had the Blue Room for 400 diners/175 dancing couples, and the Rose Room for a further 300 diners/150 couples. Dancing followed supper, with music provided by the Joe DeCourcy live orchestra. In 1936, the Pavilion was renovated and became known as the Club Esquire supper club, with stage shows and dancing. In 1941, the building was converted into the Top Hat night club. It was demolished in 1956 to make way for the new westbound lanes of Lake Shore Boulevard. The boardwalk was removed and replaced with a boardwalk made of recycled plastic planks. A children's playground was built just east of the Ryder Pool. A recreation trail, part of the Martin Goodman Trail, was built south of Lake Shore Boulevard through the area for cyclists and in-line skaters. The Grid’s resident Brit discovers Toronto, one lunch hour at a time. Take a European lunch hour (i.e., a long one) and ride the Bloor-Danforth line all the way to Kennedy Station. Then jump on the 116 bus for 20 minutes and you’ll come to Guildwood Park, where Toronto’s beautiful buildings go to die. Seventy fragments from demolished buildings have been assembled into a sculpture park here, within the formal gardens surrounding the now-closed Guild Inn atop the Scarborough Bluffs. You can find everything from the remains of the Temple Building, once the tallest in the British Empire, to the fireplace salvaged from the Annex home of Sir Frederick Banting, co-discoverer of insulin. Many of the building bits come from fancy old banks, and a casual observer could easily conclude that Toronto once looked like ancient Rome: It’s all Greco-Roman pillars and frescos. 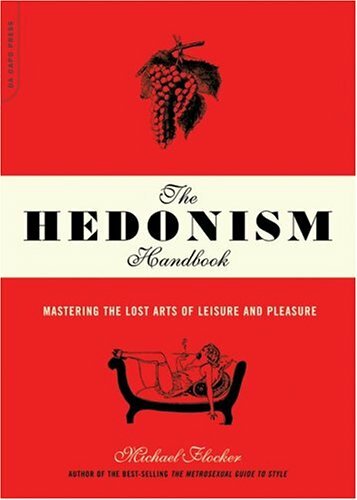 > another seriously exciting recommedation from THE LUNCHTIME TOURIST (how come I never thought of it!) this is going to be a gift to myself someday! Arrow, The Ultimate Weapon (Movie - 2011) Also known as "War of The Arrows"
13 years after the King Injo Revolt, the Chosun Dynasty is attacked by the Chung Dynasty of China. 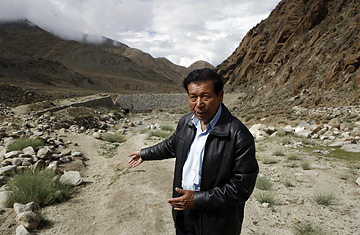 A young man named Na-mi leaves his demolished village to find his young sister, Ja-in, and her finance Su-koon, who were to wed on the very day of the attack. While on his mission to rescue her, he is being traced by Jushinta, a fierce Chung Warrior, and his band of malicious men who are out to stop him. Na-mi has but a day to rescue his sister before she is taken away to be a slave. When Na-mi finally finds his sister, Jushinta comes between them and a fierce battle between two of the finest warriors unfolds. I was there> MUST WATCH MOVIE!!! Queen's Quay Terminal was a cold storage warehouse facility, the Toronto Terminal Warehouse, built in 1926 by Moores & Dunford (NYC) and converted to a condo/mall complex in 1983 (The southwest section was demolished and forms the south end of the parking lot between Queen's Quay Terminal and the EnWave PowerPlant). The renovations by Zeidler Roberts added 4 floors to the original 10 floor structure, for a total of 750,000 square feet (70,000 m2) of space. The New York Times mentioned it as an example of successful revitalization efforts in Toronto during the 1980s. The Art Deco facility houses a shopping mall that includes a Sobeys grocery store. 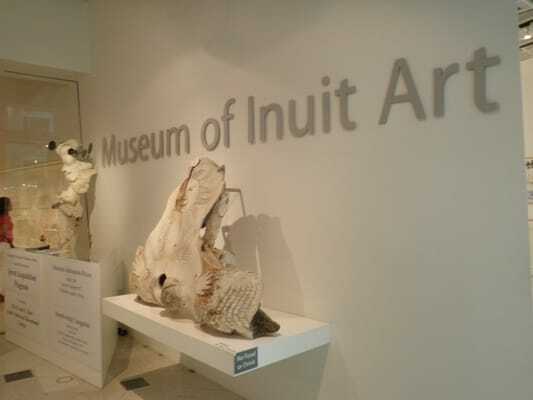 It is also home to the Premiere Dance Theatre and the Museum of Inuit Art. Yahoo! Canada and Anheuser-Busch InBev's Canadian unit Labatt both maintain offices in the building. An abandoned cold storage facility (Central Warehouse Cold Storage at Montgomery Street and Colonie Street) identical to its original appearance exists in Albany, NY. MISSION FOR TODAY: Find this place!! The first building, now known as Commerce Court North, was built in 1930 as the headquarters of the Canadian Bank of Commerce, a precursor bank to the current main tenant. Designed by the Canadian firm Pearson and Darling with the American bank specialists York and Sawyer as consulting architects, the 34-storey limestone clad tower was the tallest building in the British Empire/Commonwealth for roughly three decades, until 1962. At the time of its construction, the building was one of the most opulent corporate headquarters in Canada, and featured a public observation deck (since closed to the public due to safety and liability concerns). Brascan Corporation can be traced back to the dawn of the 20th century and South America, where Canadians played a role in the early development of hydroelectric power generation, street car lines, and gas and telephone systems. The power business came first, beginning in 1899. The Brazilian Traction, Light and Power Company Limited, formed in 1912, amalgamated infrastructure operations in Sao Paulo and Rio de Janeiro. Brazilian Traction, Light and Power Company, meanwhile, sold off its telephone operations to the Brazilian government. The company was renamed Brascan. A decade later, in 1979, the power business, too, was sold to the government, and Edper acquired controlling interest in Brascan. North America became the central focus for investment in the power industry. In 1973, Brascan had acquired Great Lakes Power Company and its hydroelectric facilities. The independent company had been incorporated in the early 1920s to provide power in northern Ontario. 1976: Edper Investments becomes the major shareholder of Trizec. 1979: Edper acquires a controlling interest in Brascan. 1989: Edper Investments Ltd. is renamed Edper Enterprises and makes its public offering. 1997: The Edper Group and Brascan Limited combine to form EdperBrascan Corporation. 2000: The company is renamed Brascan Corporation. 2005: changes its name to Brookfield Asset Management (BAM). In an effort to beef up its already impressive real estate business, in 2003, Brascan got involved in a bidding war for the control of the United Kingdom's Canary Wharf Group. It also entered into one of the largest financing deals ever constructed in the commercial real estate market. Although losing the bid for control of London's Canary Wharf in 2004, Brascan gained 72 New York State hydroelectric generating plants. The two deals represented the wave of the future. 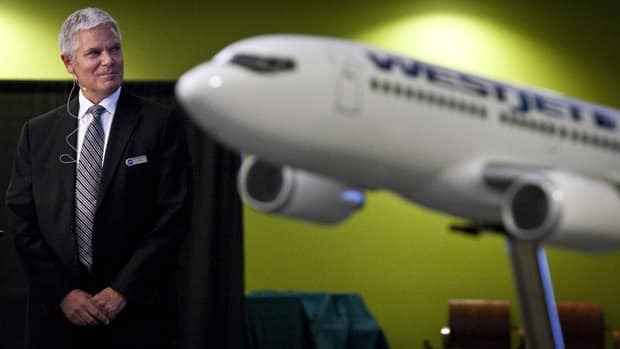 "For Canada's Brascan Corp., it's goodbye, rocks and trees, and hello, buildings and dams," wrote Elena Cherney for the Wall Street Journal. By focusing on power generation and real estate, Brascan felt it would draw in more institutional investors growing portfolios for the wave of retirees on the horizon. Peterborough Utilies Inc. to manage electrical generation and retail services. Peterborough was one of the first places in the country to begin generating hydroelectric power. Companies like Edison General Electric Company (later Canadian General Electric) and America Cereal Company (later to become Quaker Oats), developed hydroelectric generating stations to take advantage of this inexpensive, efficient and reliable energy resource to provide power to their manufacturing facilities in Peterborough. Originally built in 1884 and located on the Otonabee River within the City of Peterborough. This facility was acquired from Quaker Oats in 1975. The station produces 4 MW of power that is distributed within the City of Peterborough. Built in 1910, this 6 MW station is situated at Lock 14 on the Trent River a few kilometers north of Campbellford. The facility was acquired from the Campbellford-Seymour PUC in 2000. PUI is a partner in Trent Rapids Power Corporation and will operate the Robert G. Lake GS under contract with TRPC. The station has been named for “Bob” Lake who was General Manager/President of the Peterborough Utilities Group (and it’s predecessor the Peterborough Utilities Commission) for almost 20 years. All three hydroelectric generating stations operate as run-of-the-river facilities in order to minimize their environmental footprint while producing a reliable source of "green" energy. PUI sees electricity generation as a key area of growth in the future and is pursuing a number of additional project opportunities. PUI’s focus will be on the development of renewable and clean energy resources including solar hydropower and landfill gas. PUI recently commenced construction of the 10 MW Lily Lake Solar PV project located northwest of the City of Peterborough adjacent to Hydro One's Dobbin Transformer Station. In addition, PUI recently executed a Feed-In-Tariff (FIT) contract for a 2 MW landfill gas (LFG) generation project to be located at the County/City of Peterborough Waste Management Facility on Bensfort Road. Back at the turn of the twentieth century electricity was only starting to make its way into affluent homes. Electric trolley cars appeared on main streets to replace horse-drawn transit. Cities completed to be the first to have those streets lit with clean, bright light. In the small Ontario city of Peterborough, the town fathers came up with the idea of "the Electric City," claiming that theirs was the first in the Dominion to boast electric street lighting. During a period when Montreal and Toronto were still using a toxic mixture of carbon monoxide and hydrogen called coal gas to light their streets with smoky yellow flames, Peterborough's downtown George Street was illuminated by seventeen electric arc lights. During a period when the innovation was restricted to the wealthy, it was usually only opera houses and high-tone restaurants that boasted electric light. Indeed, when Thomas Edison, the quintessential American hero of the Gilded Age, inaugurated his first central-station electrical system is 1882, he placed his generator on Wall Street. Peterborough was a pioneer of Canada's industrial revolution because its fast-flowing Otonabee River offered ample supplies of the novelty that was hydroelectric power at Niagara was just starting to spark a controversy over who would control the stories falls, the Peterborough Light and Power Company had already installed a generator on the Otonabee's Dickson "raceway." The company secured the municipal street lighting franchise and lit up George Street. Peterborough's surplus power meant that by 1907 it was generating more manufactured goods than any city in Ontario on a per worker basis. Cereal from Quaker Oats (founded 1900) and canoes from what would become Peterborough Canoe became national brands. Peterborough was even further ahead of its time when it came to luring new businesses. At the end of the twentieth century cities and provinces were falling all over themselves with offers of low taxes and cheap land to lure this or that employer to set up shop. Well before the end of the nineteenth century, Peterborough had accomplished just that. In 1890 the city fathers told the Edison General Electric Company that the town was in a position to come across with land valued at $18,372, municipal services worth $12,138, and a ten-year tax holiday. The U.S. company had initially built its works in Sherbrooke, Quebec, but immediately decamped when it got an offer it couldn't refuse. The men of property who constituted Peterborough's ratepayers were similarly enthusiastic. They authorized the deal by a vote of 656 to 11. Peterborough had more than cheap land. The city sat on the Otonabee River at the foot of a series of fast-moving channels. The millraces on the river had already made the town an ideal location for the water-powered sawmills that processed timber from the dense forests of the Kawartha Lakes district. When Edison arrived, the company received fresh tax incentives to build two new power houses on the river. The company that would become Canadian General Electric emerged as one of the country's leading manufacturers of electrical apparatus. Well over a hundred years later its huge Peterborough plant remains a large industrial employer, though it has downsized in recent decades. It once produced everything from locomotives to refrigerators, from insulated wire and cable to huge hydroelectric generators. It also emerged as a key supplier to the nuclear industry, making refuelling machines and the fuel bundles that form the guts of nuclear power plants. Today its products are more limited (though the nuclear section with its fuel bundles remains a mainstay), but in the spring 2004 the plant was completing the first of six generators - each the size of a railway car- to be use in portable stations in Iraq. Also check tomorrow's post on Peterborough Utilities Inc. The Lethbridge Viaduct, commonly known as the High Level Bridge, is the longest and highest steel trestle bridge in North America. It was constructed between 1907–1909 at Lethbridge, Alberta, Canada at a cost of $1,334,525. This massive steel trestle over the Oldman River was designed by the Canadian Pacific Railway's bridge department in Montreal. The field work was directed by CPR's Assistant Chief Engineer John Edward Schwitzer. The steel work was manufactured by the Canadian Bridge Company of Walkerville, Ontario. A 100 man gang worked on the erection of the steel. Although there were some initial problems with settlement, the bridge has proved to be an enduring engineering work and is still in use today. It was built as part of a major diversion of the Crowsnest Pass route between Lethbridge and Fort Macleod. The river crossing was previously over a wooden trestle measuring 894 m (2,933 ft) long and 20 m (66 ft) high; an impressive structure in its own right. Above is a picture of the High Level bridge I took the last time I was in Lethbridge! Sorry not the best picture but atleast I have one of my own. Across rivers and chasms, over mountains, through forests, out into deserts- the slim wires run - bringing lightm, power and life. Into every corner of the country, electricity has sent its probing, creative fingers- developing farms, mines, industry and cities. ONTARIO HYDRO WAS, for nearly a century, one of the most successful public utilities in the world. The company always hired talented people to undertake its ambitious ventures. If you make your way to the stacks of a library in Ontario and search out the shelf where they keep the books on Ontario Hydro, you will notice that most of the titles play on a single word. The People's Power (Merrill Denison's book). The Politics of Power. Delusions of Power. Public Power. Power at Cost. Power at What Cost? 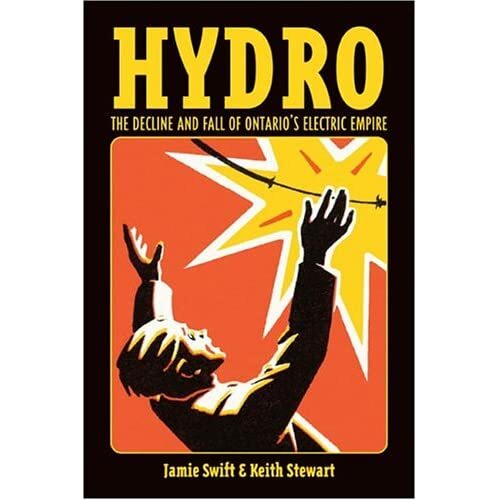 There is at least one case, too, in which the writer and publisher did not choose a wordplay on the intimate, even incestuous, relationship between electrical energy and political and economic power in the province. That book bears the simple but suggestive title Electric Empire. Travel breeds curiosity. On the road, we find ourselves waking early, wandering unfamiliar streets, watching foreign cities creak to life as the sun rises. We poke around corners, eat exotic dishes and pour over maps. We are alive to the possibilities of the world around us. Yet the more I travel, the more I chide myself for not maintaining such curiosity at home, a point made clear by a recent obsession: swimming the rivers and creeks right outside my back door. Bathurst Street - Henry, third earl Bathurst, secretary for War and the Colonies 1812- 27. The name applied to the present street south of Queen (then Lot) when given in 1837. The northern section was known as Crookshank's Lane, after the Hon George Crookshank, who owned a large estate there. Bloor Street - Joseph Bloor, 1788- 1862, a brewer who lived at 100 Bloor Street. Bloor and Sheriff Jarvis laid out the village plots for the town of Yorkville, just north of Bloor. For many years Bloor was the northern limit of the city proper. It was formerly known as St Paul's Road, Sydenham Road, and Toll-Gate Road, the latter after the toll-gate that stood at the corner of Yonge Street. Carr Street - Probably John Carr, city councillor, alderman, clerk and commissioner, 1847-73. Carr Street was originally Elizabeth Street, part of Belleuve Estate owned by Colonel George Denison. The name was changed in 1870. John Carr resided at 21 Denison Ave.
Denison Avenue - The street was one of the roads to the Denison house at Denison Square owned by George Taylor Denison and, after his decease, by his son Lt.-Col. Robert Brittain Denison (1821-1900). See Augusta, Bedford, Bellevue, Borden, Brookfield, Churchill, Dewson, Dovercourt, Esther, Fennings, Lippincott, Major, Ossington, Robert, Rolyat, Rusholme. Dufferin Street - The marqis of Dufferin and Ava, governor general of Canada 1872-8. Dundas Street - Sir Henry Dundas, first Viscount Melville, Home Secretary 1791-4. Like Yonge Street, Dundas Street was laid out by Gov Simcoe, who intended that it join the provincial capital at York with the Thames River on the west and the mouth of the River Trent on Lake Ontario on the east. Within Toronto's boundaries, Dundas Street today is formed from a series of earlier streets, including St Patrick, Anderson, and Agnes Streets west of Yonge; Crookshank Street, Wilton Avenue, Wilton Crescent, and Beech Street between Yonge Street and the Don River. Dupont Avenue - George Dupont Wells (1814- 54), son of Col the Hon J. Wells of Davenport, County York. Keele Street - William Keele, solicitor, who owned property in Toronto Junction. Queen Street - Queen Victoria (1819 - 1901). So named about 1843. Queen Street was formerly Lot Street because of the 'park lots' abutting it and extending north to Bloor Street. Lot became the northern limit of the town in 1797, as it grew beyond the original boundary of Duchess. Spadina Avenue - Spadina, the country home if Dr W. W. Baldwin, to which it was the approach. The name is derived from Espadinong, an Indian word meaning a little hill. Wolseley Avenue - Col Garnet Joseph Wolseley (1833-1913), later Viscount Wolseley, who came to Canada in 1861 as assistant quartermaster-general. In 1970 he commanded the force sent west to the Red River to quell the Riel insurrection. Wolseley Street was formerly Monck Street. Steve Jobs the mastermind behind Apple's iPhone, iPad, iPod, iMac and iTunes, has died. Please listen to/ read the commencement speech he gave at Stanford University. My third story is about death. When I was 17 I read a quote that went something like "If you live each day as if it was your last, someday you'll most certainly be right." 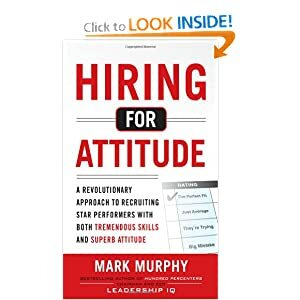 It made an impression on me, and since then, for the past 33 years, I have looked in the mirror every morning and asked myself, "If today were the last day of my life, would I want to do what I am about to do today?" And whenever the answer has been "no" for too many days in a row, I know I need to change something. Remembering that I'll be dead soon is the most important thing I've ever encountered to help me make the big choices in life, because almost everything--all external expectations, all pride, all fear of embarrassment or failure--these things just fall away in the face of death, leaving only what is truly important. Remembering that you are going to die is the best way I know to avoid the trap of thinking you have something to lose. You are already naked. There is no reason not to follow your heart. When I was young, there was an amazing publication called The Whole Earth Catalogue, which was one of the bibles of my generation. It was created by a fellow named Stuart Brand not far from here in Menlo Park, and he brought it to life with his poetic touch. This was in the late Sixties, before personal computers and desktop publishing, so it was all made with typewriters, scissors, and Polaroid cameras. it was sort of like Google in paperback form thirty-five years before Google came along. I was idealistic, overflowing with neat tools and great notions. Stuart and his team put out several issues of the The Whole Earth Catalogue, and then when it had run its course, they put out a final issue. It was the mid-Seventies and I was your age. On the back cover of their final issue was a photograph of an early morning country road, the kind you might find yourself hitchhiking on if you were so adventurous. Beneath were the words, "Stay hungry, stay foolish." It was their farewell message as they signed off. "Stay hungry, stay foolish." And I have always wished that for myself, and now, as you graduate to begin anew, I wish that for you. Stay hungry, stay foolish.